In film, the big difference between pastiche and homage is the underlying attitude towards an original source. Pastiche – often a lazy assemblage of genre elements – is aimed at mocking something the filmmaker feels superior to (like the recent Disco Exorcist). Homage, on the other hand, arises from admiration for the source, respect and even love. The debut of writer-director RZA falls into the latter category. Given that RZA was one of the founders on the Wu-Tang Clan, named after one of the two primary classes of Chinese martial arts (the other being Shaolin), it’s not surprising that he displays a deep knowledge and affection for traditional Chinese martial arts movies in The Man With the Iron Fists. Although shot in English, everything about the movie feels authentic. It has that gaudily colourful, slightly grainy look of ’70s Chinese action movies; the fights are superbly choreographed by the great Corey Yuen and filmed with a respect for the action rather than obscured by excessive editing. The characters are larger-than-life in that operatic way which is a mark of the genre. The complicated plot involves a large shipment of imperial gold which is to pass through Jungle Village with the protection of the Lion Clan. 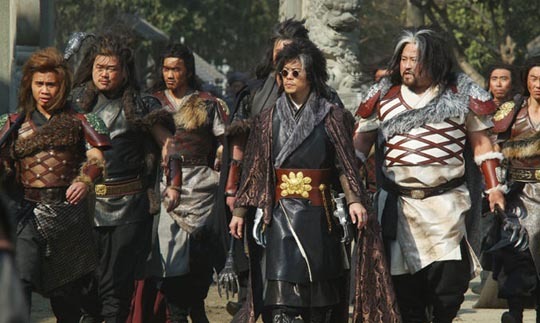 But the ambitious Silver Lion (Byron Man) has other plans and assassinates leader Gold Lion (Kuan Tai Chen), intending to hijack the gold with the help of the sinister Poison Dagger (Daniel Wu). 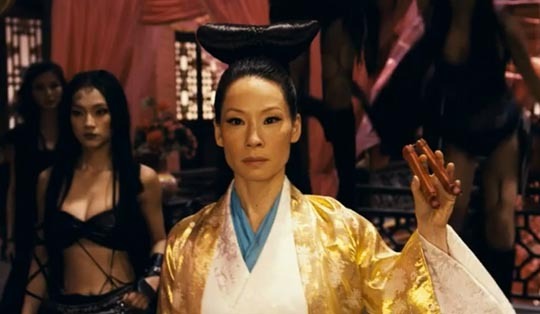 The action centres around the elegant local brothel run by Madam Blossom (Lucy Liu), where the mysterious European Jack Knife (Russell Crowe) has just arrived with obscure motives. But the story centres on the local blacksmith who, though troubled by his conscience, forges weapons for every side in an attempt to raise enough money to buy the freedom of the prostitute he loves, Lady Silk (Jamie Chung). Thadeus, played by RZA himself, is a former slave who after being granted his freedom found that it counted for nothing with the white society of the Old South, so he fled as far as he could, ending up in this remote Chinese village where he has learned the ways of the Buddhist monks who rescued him from a shipwreck. As things heat up with the approach of the gold, Thadeus finds it increasingly impossible to keep his head down and is eventually forced to join the fight against the Lion Clan. For anyone who likes this genre, The Man With the Iron Fists offers the same pleasures as discovering yet another great but previously unknown movie by the likes of Chang Cheh, Yuen Chor, Liu Chia-Liang or King Hu. These are operatic films fuelled by heightened emotions, the fight scenes structured like dance numbers in a musical. RZA directs all this without the slick, self-conscious post-modern ironies of Tarantino or the overblown straining for effect of the Wachowskis. It’s as if he has completely internalized the culture which produced these movies. He doesn’t call attention to what he’s doing and the result is a completely satisfying entertainment with emotional investment in its characters and occasional moments of visual beauty which get at the essence of the genre’s paradox – the tension between bone-crunching violence and a sense of the spiritual underpinnings of martial arts philosophy. There was nothing in Tarantino’s Kill Bill to match the image of Lady Silk’s prostitute warriors floating down around her like falling blossoms as she moves to face the attacking Lion Clan. And although all the actors appear to be really enjoying themselves, none of them condescends to the material. 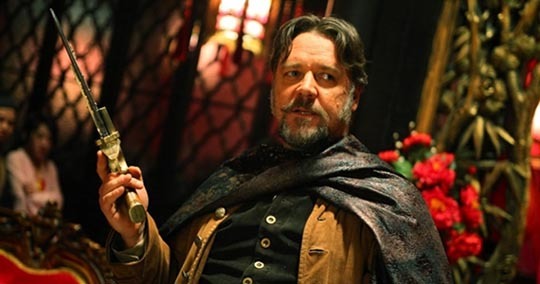 The villains are robust, RZA embodies a sense of romantic tragedy, and Russell Crowe revels in the kind of star excess which always made Oliver Reed so entertaining to watch. I haven’t had this much fun at the movies in a long time. This entry was posted in Review and tagged Action, Martial Arts. Bookmark the permalink.